If you’ve taken a trip to a health food store, or even Whole Foods, you’ve probably noticed a juicing station, or bottles of juices priced at $8 per bottle. So, why is everyone buying pricey bottled juices? Juice can be full of vitamins and antioxidants and is often promoted as a “jump-start” to a healthy diet, however many Paleo eaters don’t buy into juicing. Here are a few reasons why juices have fallen out of favor in the Paleo-sphere: juices are often full of fruit, and while fruit can be healthy, it’s also full of sugar (albeit natural sugar, but sugar is sugar). Juices are also generally full of carbohydrates from fruit and vegetables, but lack fat and protein which are important factors for satiety and for actually absorbing the nutrients in fruits and vegetables. Lastly, juicing removes the fiber from fruits and vegetables, which can reduce satiety, and leave you hungry an hour later! However, with all that said, an occasional vegetable-filled juice like this one has its place in a healthy diet. 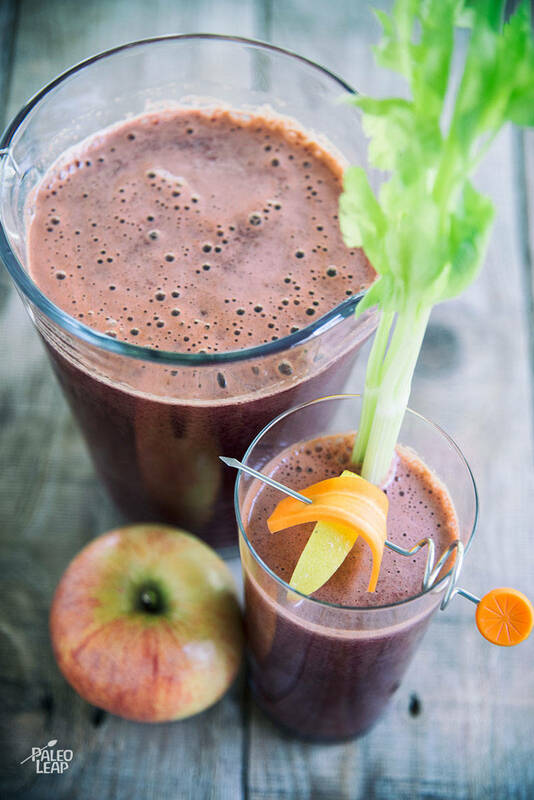 If you can’t seem to tolerate fiber-filled vegetables or are having trouble digesting veggies, then this juice can be a way to begin replacing some of the vegetables you’re missing out on. If you’re enjoying this juice for breakfast, pair with a protein and fat-filled breakfast like hard-boiled eggs or a slice of a frittata. Place all ingredients one by one into a juicer and serve cold. Or, pulse in a blender with 1/2 cup water, until you get a smooth texture. Use a fine mesh sieve to strain the liquid, and serve cold. Feel free to add more water if too thick.